COLOR(S):Red brindle, reds, piebald, with or without black mask. 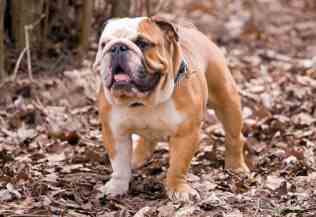 The Bulldog is the national symbol of Britain. 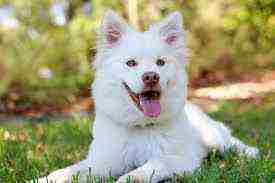 This dog breed has a medium size, dense and powerful, low-slung body with wide shoulders and a massive short-faced head, smooth coat. Despite its early breeding to bait bulls, the Bulldog is gentle and good-natured and makes an excellent companion for the whole family. An ideal pet, as he loves to be in the company of his family. He adores children and makes an excellent companion to them because of his gentle, sometimes stubborn nature. He is a laid-back, loyal good natured and undemanding companion who would make a great companion for the elderly who do not want to feel guilty for not walking him or the "couch potato" family. Contrary to popular belief he does not drool, but he may snore. The Bulldog is a friendly and good-natured dog breed. Gentle, affectionate, docile, and mellow, very good with children and strangers. A lot of human attention is required for their happiness. When Bulldogs are young, they are full of energy, but slow down as they get older. Some Bulldogs may be aggressive with strange dogs, but generally get along well with other pets. Bulldogs have been bred smaller and more compact, creating many health problems. They are very susceptible to overheating, itchy skin, allergies, difficulty breathing, brachycephalic syndrome, eye problems and reproductive problems. Due to the prized wide chest and small hips that show rings emphasize, many puppies must be born Caesarean section because they cannot fit through the birth canal. Other health concerns include elongated soft palate, small trachea, heart problems, hip dysplasia, shoulder luxation and internalized tail.Bulldogs have been bred smaller and more compact, creating many health problems. They are very susceptible to overheating, itchy skin, allergies, difficulty breathing, brachycephalic syndrome, eye problems and reproductive problems. Due to the prized wide chest and small hips that show rings emphasize, many puppies must be born Caesarean section because they cannot fit through the birth canal. Other health concerns include elongated soft palate, small trachea, heart problems, hip dysplasia, shoulder luxation and internalized tail. Bulldogs would also prefer not to take any exercise, and therefore must be exercised minimally, making sure they get it but not overworking them. Bulldogs can be a bit dominating and need an owner who knows how to display strong leadership and understands alpha canine behavior. A Bulldog who understands it\'s *place* in the human pack, is nice to, and reliable with all people. This breed is good with family pets, but some can be combative with strange dogs if they do not see themselves as followers in their pack. When Bulldogs are young, they are full of energy, but slow down as they get older. They snore very loudly, most have drool and slobber tendencies and are messy eaters. Bulldogs who display guarding, behaviors, such as guarding furniture, food, toys, or other spots in the house, or who are dog aggressive, do not have humans who are being the dogs pack leader. This behavior only happens when dogs are allowed to take over. These behaviors can be corrected when the owners start displaying the proper leadership.